Along with caraway, carrot and parsley, cumin belongs to the Umbelliferae family, named for the plants. The aroma is deliciously fragrant. My staple addition for stew. Thank you. First time trying out this spice and I love it for flavouring! Can't wait to try out this spice more different foods! Just love this company, Simply Organics. They have it all covered from fresh, vibrant herbs and spices to being able to reuse the jar. Now here is something else I love and that is that Well.ca provides the country of origin for the product as well as using the botanical name. Very important information ! Thank you, Well.ca ! Love, love, love this aromatic and vibrant tasting spice. Simply Organic always delivers on top quality products. The glass jar is a bonus and can be reused. Excellent choice, you won't be disappointed. Loved this spice, wonderful that it is organic, and looking forward to purchasing other spices of this high quality. Love the freshness of this spice. I end up using it everyday! I love this brand of organic spices and herbs. I find them fresh and filled with flavor. Will definitely buy again. Also there is a large amount in the bottle. 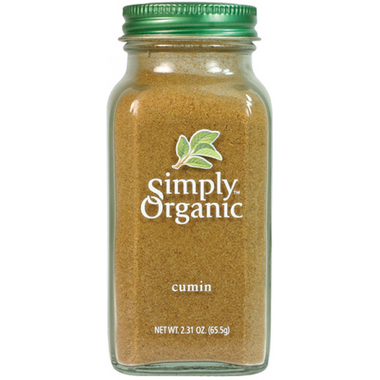 I usually buy seed and grind it, but it's so handy to have ground cumin on hand, and it seems as fresh to me as the stuff I grind myself from good seed. In my experience, all of these Simply Organic spices are top of the line. They are super fresh and come in lovely glass bottles, which can be reused indefinitely, and they fit a surprising amount of spice inside. Could not be better. I love these. Great with black beans and rice.